Data Searches allow you to browse for entities' records and filter the result relying on multiple criteria. In this article you can find all the information related to the use of the already configured searches. For information about how to configure them visit this article. 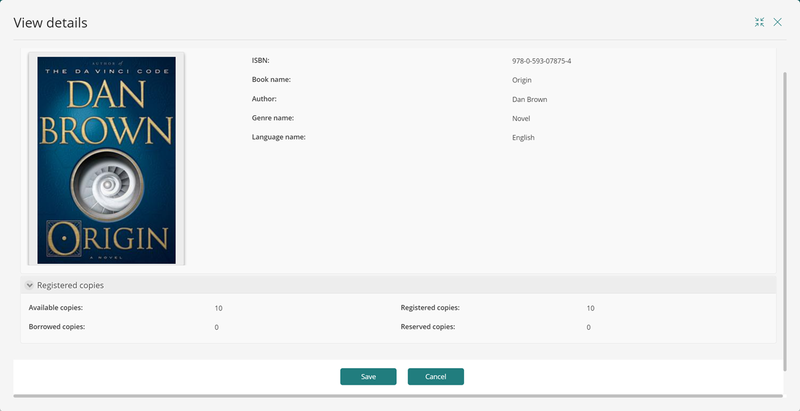 In this section of the article we will review the capabilities that are given to your Stakeholders in the Work Portal when Data Searches have been defined for their contexts. Lets take a Library as an example. Smith is a Librarian and for such Stakeholder a couple of searches have been defined. When he clicking the search bar on the top right corner, all available Searches are listed. As it can be seen on the previous image, there are two Data Searches defined for Librarians like Smith: Search reservations and Search Books. 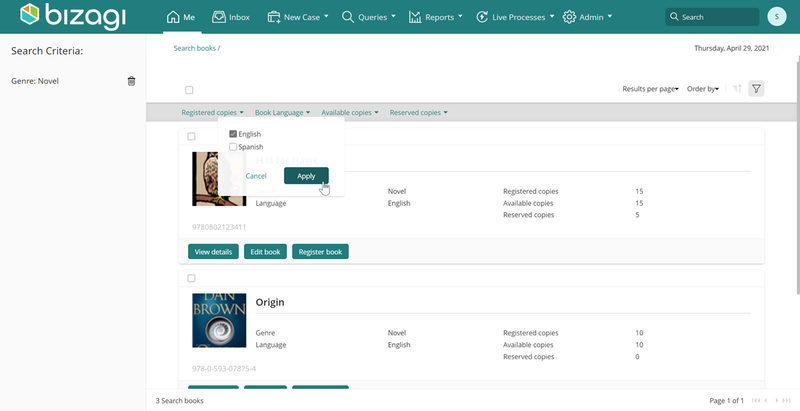 This searches allow to check the book reservations that have been made, with their corresponding details, and check all the registered books on the library. Lets dig deeper into the Search books Data Search. 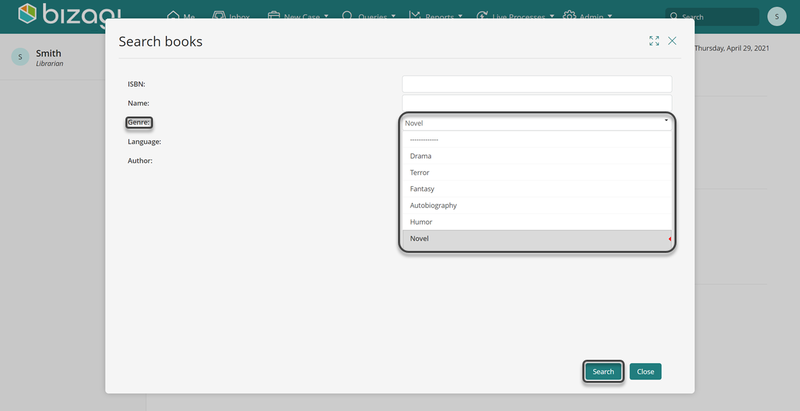 As soon as Smith, the Librarian Stakeholder, clicks a Search, the form that was previously configured in Studio pops up. In this case it prompts Smith for details about Books he is looking for. All information provided by Smith in this form is used to narrow the Search, whose results will be reflected in the retrieved records. Smith needs to review some details about the book "Origin". He uses one of the controls to narrow down the records. In the following images you can see how Smith searches for that specific book through the given results. Some areas of the window above have been marked with a number to highlight important features that Searches comprehend. The corresponding explanation of those features is in the list below. On the left panel of the screen the Search criteria is listed. For each criterion there is a delete icon. When clicked it clears that specific criterion from the Search parameters. The page is then refreshed and the updated list of results is displayed. Just under the Work Portal's ribbon all available filters applicable to the search results, are shown. These filters are automatically added by Bizagi based on the type of attributes included on the entities's template. Attribute types like Integers, Booleans, Dates, Related entities and some others are considered. Filters are useful when the search results are to be refined. For example, as Smith wanted to specifically review the book "Origin" he can use the Language filter to rule out all books in Spanish. The result list is updated. An X icon next to the filter that was used is displayed, as well as a red dot with a number over the filter icon. This allows to clear the filter that was just added, and informs about the number of filters that have been included. When an additional filter is added, the clear icon is shown and the total number of filters is updated. Please note that filters are applied as an AND operation. This means that the list of results contains all the records that match all filtering criteria. 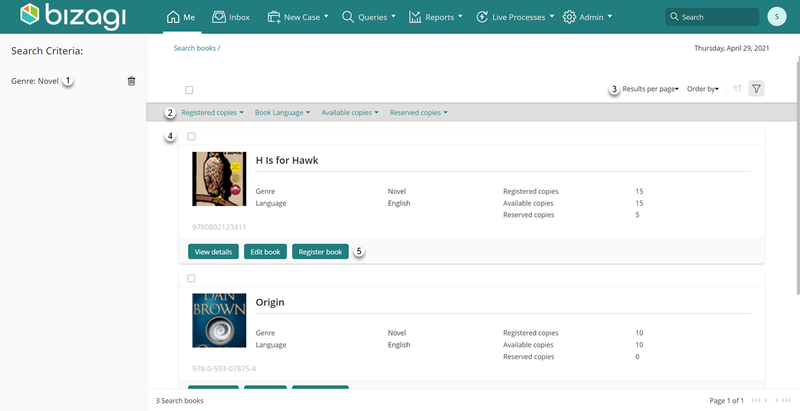 In the previous example the shown results are those books in which Genre is a Novel, Language is English and it has 10 available copies. •Results per page: allows to choose the amount of results shown per page. This is especially useful when the result set is vast and you want to tackle it by a specific amount of records at a time. •Sorting criteria: allows you to choose by which attribute of the entity the results are to be sorted. •Sorting direction: a switch to toggle between ascending and descending order. •Show / Hide filtering options: toggle between showing and hiding the filtering options. Hiding the filtering options do not alter the filtering criteria that are already configured, it visibly hides the filtering bar. In the main panel all the records that meet the filtering criteria are shown. If no template is defined for the entity that is being searched, the results will display as a set of default attributes. Note that the set of results are paginated to simplify the navigation. 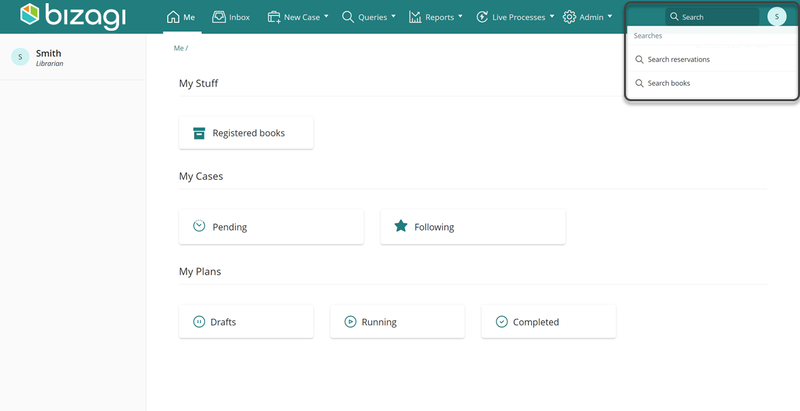 The pagination options are available at the bottom of the screen to move to next or previous pages, move to the first or last page, and also display the current page number and the total number of results. 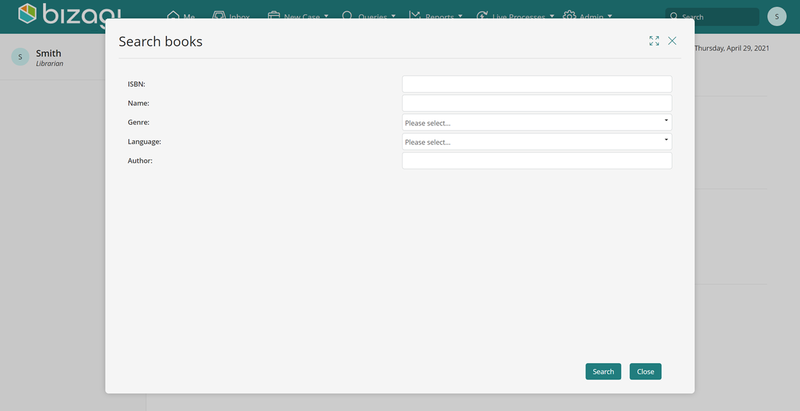 If there are Actions defined for a Stakeholder to perform over the specific Entity that is being searched, they are displayed as teal buttons under each result's card and can be directly triggered from the search results. 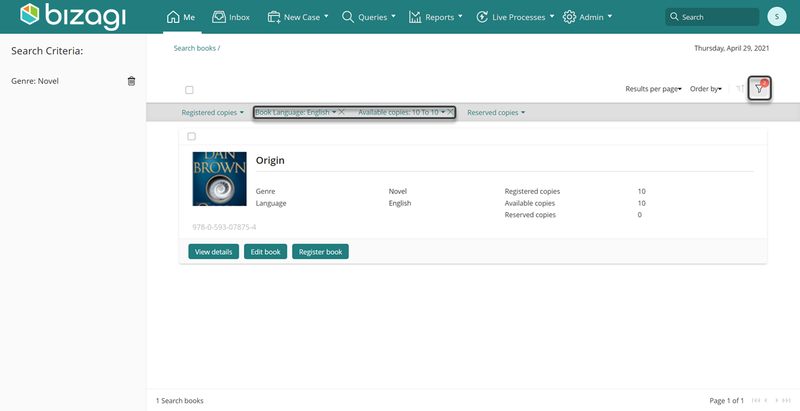 For example, below if the form of the Action View details for the "Origin" book.